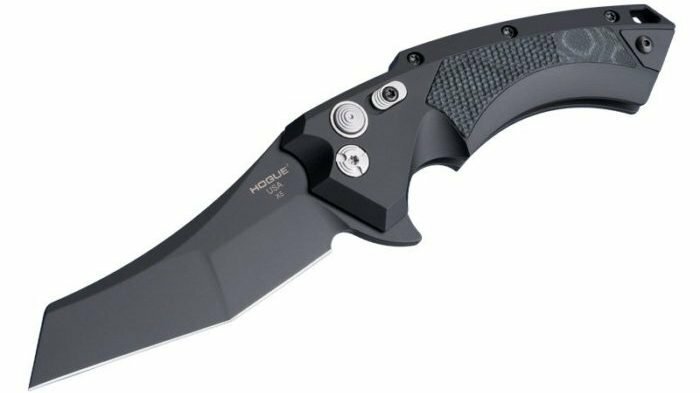 Hogue’s X5 folding knife uses a push-button safety, with an additional manual sliding safety bar. The new X5 folding knife from Hogue is a very attractive and functional everyday carry (EDC) knife. Made with a high quality 6061-T6 anodized aluminum frame, and a blade formed with the hot trending CPM154 stainless steel, the Hogue X5 appears to have all the right components to be capable of enduring a wide range of uses. When selecting a knife for any type of serious use, the buyer must pay particular attention to the materials used in construction. When I first became serious with knives I had no idea about the variety of materials that were available. About all I knew was “stainless” steel was supposed to be better for corrosion and wear than a non-stainless steel. Though I still have much to learn in the broad world of metallurgy, I am much more confident in my selections. 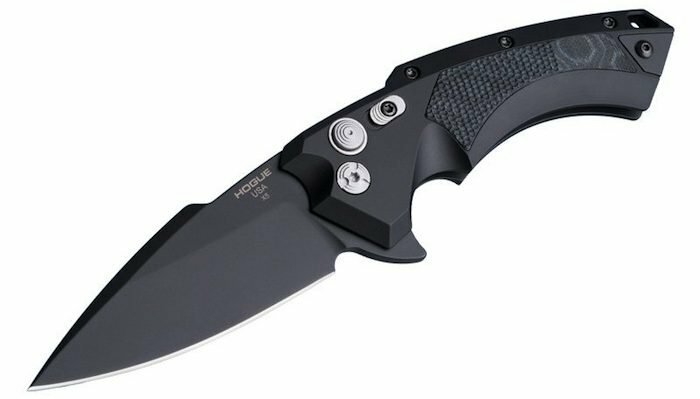 The CPM 154 stainless steel Hogue selected for the X5 folding knife is gaining a lot of favor among manufacturers and users alike. From what I’ve read, CPM154 stainless steel has the dual benefit of maintaining a good edge, but also reasonably sharpens when necessary. The Hogue X5 is made from high quality metals, and should be able to provide a lifetime of support with proper maintenance. The X5 spear point blade will have a Cerakote finish. The blade of the Hogue X5 comes in a Spear Point configuration, with an opening assist flipper. Trying the X5 out at SHOT Show 2017 I found the flipper mechanism was very easy to use and achieve blade lock-out. The X5 blade will have a black, or tan Cerakote coating on the exterior of the blade providing outstanding protection from rust, corrosion, or other forms of wear. There is possibly going to be additional Cerakote colors for the blade (to match the G-Mascus® G10 grip inserts) as well. The Hogue X5 blade is 0.15 inches thick, and has a hardness rating of 57-59 on the Rockwell Chart. There will be a 4.0 inch and 3.5 inch blade option. This is a very good hardness rating, that exceeds many of the knives in this category. In addition to the high quality CPM 154 stainless steel material, Hogue cryogenically treats the X5 blade. This is a procedure not often performed, and typically is reserved for the better knives on the market. Many knife blade go through a quenching process to attain better qualities of the steel. However, the cryogenic treatment process goes much further to improve steel strength and quality by rapidly cooling the steel to provide a much stronger steel structure. The X5 G-Mascus® G10 grip inserts will have color options later this year. The Hogue X5 is currently offered in black, black and tan, green, and a tumbled blue color options for the G-Mascus® G10 mini-piranha grip inserts. The use of G10 for knife grips has been very popular for many years. G10 provides an outstanding texture for gripping, and is also quite capable of withstanding exposure to the elements. Here, Hogue selected to have mini-piranha G10 inserts, rather than making the grip of the X5 completely out of G10. This combination provides the benefits of G10 inserts in the heart of the grip, as well as the benefits of weight and contour from the 6061-T6 aircraft grade aluminum. The G10 inserts are dimpled over roughly 75% of the insert to provide additional grip texture for the user. The selection of high quality materials gives the user the best assurances for longevity and durability out of this knife. There are (2) safeties on the Hogue X5: a push-button bar, and a manual safety lever. 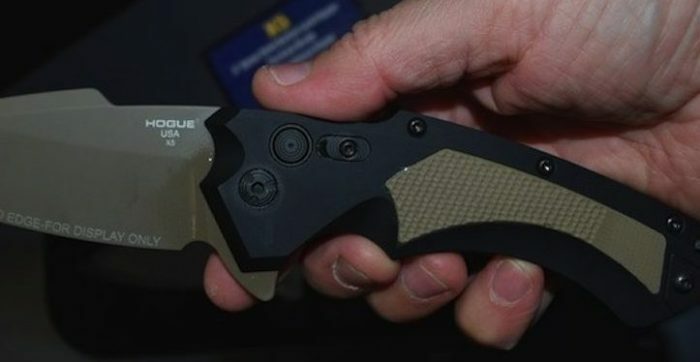 Hogue selected two separate safeties for the users of the X5 folding knife. First, there is a push-button safety bar that locks the blade into the open position. To fold the blade back into the handle the user presses the push-button safety to unlock the blade. Hogue adds a manual safety lever located just behind the push-button safety bar. When engaged, this manual safety lever prevents an accidental blade unlocking from an inadvertent press of the push-button safety bar. This is an outstanding feature for a folding knife, and provides a much more secure and confident feel to using the X5 under hard use. These are designed for right-handed users, however. Hogue’s X5 pocket clip is ambidextrous with a tip up carry style. There will be an ambidextrous stainless steel pocket clip for the Hogue X5 folding knife. Hogue describes the positioning of the pocket clip as “deep pocket carry” suggesting a more concealed carry profile. The pocket clip is fairly standard in configuration, though its stainless steel material is an upgrade providing greater protection when exposed to the elements. There is also a lanyard slot on the rear spine of the handle should a user desire to carry the X5 in that manner. Manual safety lever to lock blade open. Another look at the folded Hogue X5. There is a fore finger groove at the front of the X5 handle providing a great balanced hold. 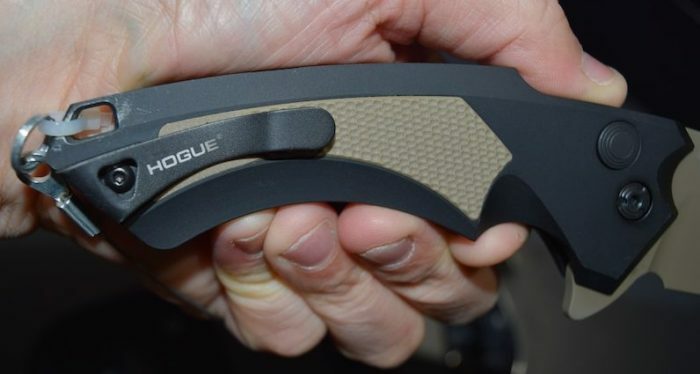 I was really impressed with the Hogue knives at SHOT Show. It was my first encounter with the knives, despite them being on the market for a few years now. I suppose I just never thought about Hogue being in the knife business. The new X5 folding knives are very impressive. The material selection is outstanding, as well as the dual safety feature. I really appreciate having a secondary safety on a folding knife. It is just too easy to accidentally disengage a single safety, and end up with sliced fingers from a blade closing on them. The cryogenic treatment and Cerakote finish on the Hogue X5 blade is another fantastic feature. Both of these features provide an excellent blade quality and help ensure the blade will have a very long service life regardless of working conditions. The G-Mascus® G10 inserts and color options are excellent choices as well. They felt great in my hand, and provide incredible confidence for long-term performance and durability. The one drawback for the Hogue X5 is the price! Typically I’m not in the market for knives that cost over $150. Part of this is obviously the cost of the knife. As most police officers understand, “we didn’t get into the job to get rich.” Starting officers, or those with families, feel the budget crunch daily, so any purchase over $50 becomes a serious consideration. In addition to the financial consideration there is a practical side as well. The knife market has dramatically improved over my 20-year law enforcement career. Everything from steel quality and features, to ball-bearings and safeties. With all the improvements, and increased competition, I have been able to find several serious duty knife options for much less than the Hogue X5. These alternative knives are more than capable of cutting, scraping, breaking windows, and self-defense. Several use ball-bearing technology, and dual safeties as well. I would have no problems recommending the Hogue X5 for duty or heavy use. I’m confident a buyer will be pleased with their choice of the X5 folding knife. However, a buyer with a tight budget should know alternatives may satisfy their needs at half the cost! The Hogue X5 folding knife as very comfortable to hold. The Hogue X5 Wharncliffe blade option takes on a unique appearance.